The APEC RO-90 and RO-PH90 are great systems in terms of quality, capacity and affordability. Both systems received Gold Seal Certification by WQA on the quality of the product. It is definitely RECOMMENDED for large families. Let’s explore some of the key features for this awesome filtration system. As advertised by APEC, the daily production rate can achieve up to 90 GPD at the optimum condition (60psi and 77 Deg F) and 75 GPD at 50psi. The appearance of the system looks quite similar to the ROES-50, but it is geared with a higher capacity filtration system in it. The differences in the filter allows water to flow at a higher rate and capable of handling a larger volume. The RO-PH90 has an additional filter which consists of a natural way by adding calcium carbonate to neutralize the slight acidic reverse osmosis water. The pH is expected to be in the range of 8-9 which is optimum for the absorption of our body. APEC has a record of producing long lifespan filters which can lasted for a year. Similar to the ROES-50, the filter replacement for RO-90 and RO-PH90 are in a yearly basis. Waste water is expected for all reverse osmosis system, including APEC reverse osmosis system. The waste water stays at a 1:3 ratio where every gallon of pure water produced, 3 gallons of water will go down to the drain. It is certainly not the best, but it is not the worst. Below are the summarize technical specification that you should know before buying the APEC RO-90 / RO-PH90 reverse osmosis system. Stage 1: 5 Micron Sediment Filter – Standard 10″ Industry Grade which is capable of removing dirt, dust, particles and rust. It is made of high grade high capacity polypropylene which has longer lifespan. Stage 2 & 3: 2 Stages of Premium Extruded Carbon Block – Removes odor and taste of chlorine, VOCs and other common chemicals that was found from the source. 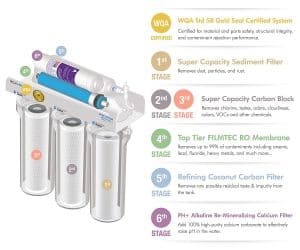 Stage 4 :Select FILMTEC (Dow Chemical) High Rejection TFC reverse osmosis membrane– Remove up to 99% dissolved solid such as flouride, bacteria, lead, radium, virus which is larger than 0.00001 micron using the membrane. Stage 5: Advanced Coconut Shell Refining Carbon Filter – Remove odor and taste that are coming from the storage tank. Stage 6 (Only for RO-PH90): Calcite Acidic Water Neutralizer – Increase the pH on the slight acidic reverse osmosis water by adding high quality calcium carbonate. 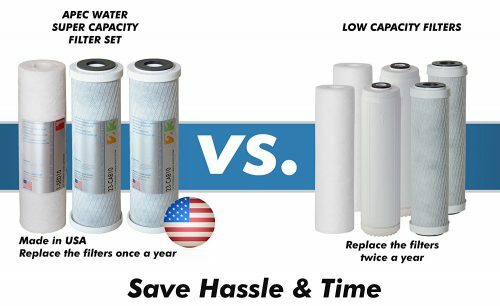 Unlike the ROES-50, the carbon blocks and reverse osmosis membrane are better in quality and able to handle higher in capacity. APEC’s filters are famous for it’s quality and also their long lifespan. The installation is pretty straight forward as the installation manual is easy to understand. If you have experience in installing water filters, it should takes about an hour. Spend some time reading the manual before you start installing as it gives you a better idea on the workflow. The diagram below gives you a great picture on how the installation and final product sits under your sink. On average of five years, the replacement cost is just $56 per year for RO-90 and $85 per year for RO-PH90. With the capacity and capability of this filter, the maintenance and replacement cost is consider affordable as compared to other model in it’s class. – I really wish the tubs were a bit better made. High Flow Rate: It is capable of generating up 90 gallons per day of clean filtered water. Alkaline Remineralization: Only for RO-PH90, it uses natural remineralization stones to increase the pH of the water. Long Lifespan Filters: Excellent filters will last longer and lower down the maintenance cost. Find out the latest price our #1 recommended online store, Amazon. Click on the button above to check on the latest pricing and reviews by happy customers. Wondering how does the APEC RO-90/RO-PH90 compared to others? Find out more on our best reverse osmosis system. Thank you for the review on these filters. The information was very useful in helping me identify the difference in performance and economics with the RO-90 and RO-PH90 and other top models. I am in the market for a water softener and will refer to this site often. You are welcome. Hope this gives you a clear view on both APEC Top Tier models. Your article is really helpful! I am interested in RO-90. It looks great! I would like to install it on my refrigerator. Can I install it with the ice maker on my fridge? Thank you! Yes, definitely. You can connect it parallel to your sink with some additional tools. They both look top notch! What does reverse osmosis do, and what does Apec’s system do compared to other brands or those that use faucet or container filters like PUR and Brita?! PUR and Brita filters are entry level water filters. Their speciality are water pitcher and faucet filters. Those filters just remove a fraction of the contaminations that a normal reverse osmosis does. Furthermore, the filter replacement is quite frequent (Once every 2 months). If you are a student or just renting a temporary accommodation, PUR and BRITA is great due to it’s portability. 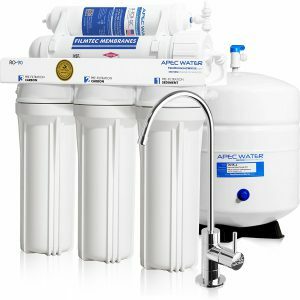 If you own a house, I would recommend that you go for those conventional under sink or counter top water filters like APEC.